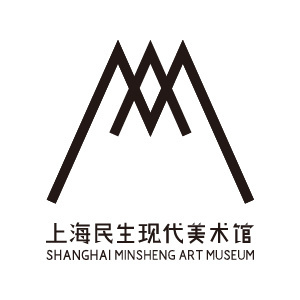 Shanghai Minsheng Art Museum was established by the China Minsheng Bank for the purpose of promoting contemporary art and culture. Building a world-class museum is part of the corporate responsibility platform of the China Minsheng Bank in a mission of "bringing art to the public, bringing people into the realm of art". The museum is committed to a model which includes international exchange, and a broad range of public education activities to open up a viable space for art. In the interest of fostering an understanding of art within the general public and creating a pluralistic landscape of art and culture,the museum is creating a dialogue between pure art and applied art; traditional art and the avant-garde art, to break down the barriers and close the gap between art and the general public. The future collections of the museum, our exhibitions, our research and publishing and our critical sensibility will impact the creation of contemporary culture and express the cultural landscape of a new era. The museum is located in the former French pavilion of the 2010 World Expo. The building is a perfect manifestation of the Expo theme of "Better City, Better Life" and the humanistic spirit of the World's Fair. In 2010, after the closing of the Expo, the French government, Shanghai Municipal Government and the Shanghai World Expo Development Group with the support of the former China Minsheng Bank Chairman Dong Wenbiao organized the repurposing of the building to be a comprehensive museum—a platform for creativity, the arts, humanities, and contemporary art exchanges, servicing the local population of Shanghai and visitors from abroad. With the support of the China Minsheng Bank,the museum is trying to stimulate cross-disciplinary multi-cultural creation, not only to help create a renaissance in the Expo area, but also to become a symbol of art and culture—a hub of exchange and creativity between China and the rest of the world. 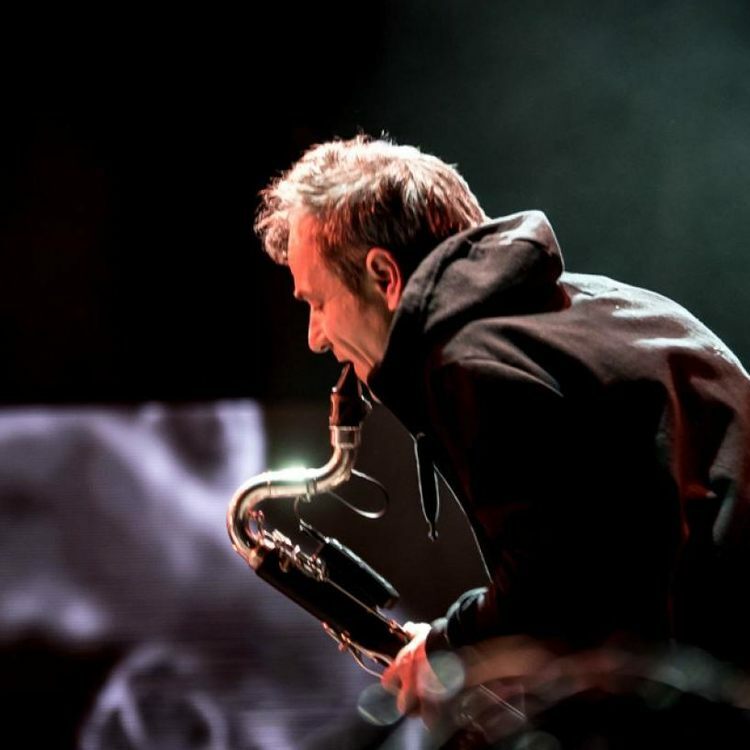 Through various exchanges between artists and art organizations, we will provide an interactive platform between artists and the public, which will eventually form an international network. The museum will foster new forms, host multifaceted large exhibitions, theater, cultural workshops, avant-garde cultural movements and experimental art projects bringing the force of creativity into the lives of the average people. As part of the CSR ethic of the China Minsheng Banking Corporation, using a core of creative exchange and the strategic advantages of the future development of the Expo site, we will carry out a wide range of public education activities to host exchanges between design, art, science and technology and music, creating an immersive creative environment for the public. With smart creative, user-friendly design, sound and light elements, the museum reflects on the idea of a modern city, the built environment and living conditions to explore the possibilities of bringing art into urban life and hopes to explore other future directions of urban development. The museum is located in the South Huangpu River Expo Park, near the Lupu Bridge, near the line 13 metro exit and near the Expo Park main corridor. 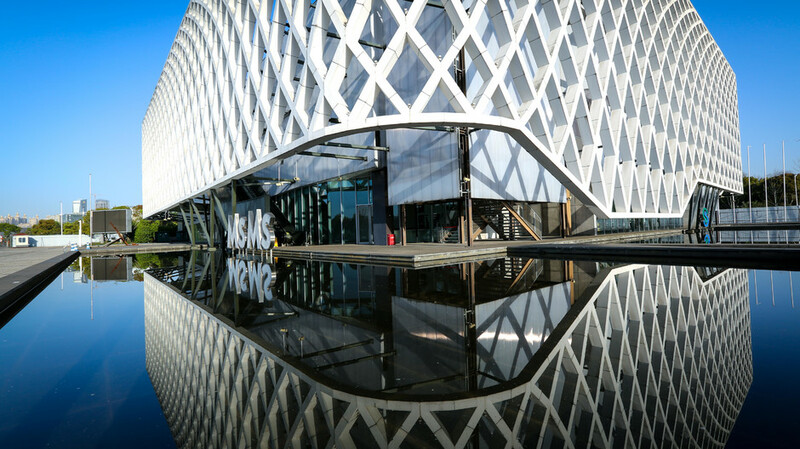 Under the support of the Shanghai Expo Group, this project has a total area of over 40,000sqm, including 8,700sqm architectural area, 8,100sqm of green space and a 10,000sqm car park. 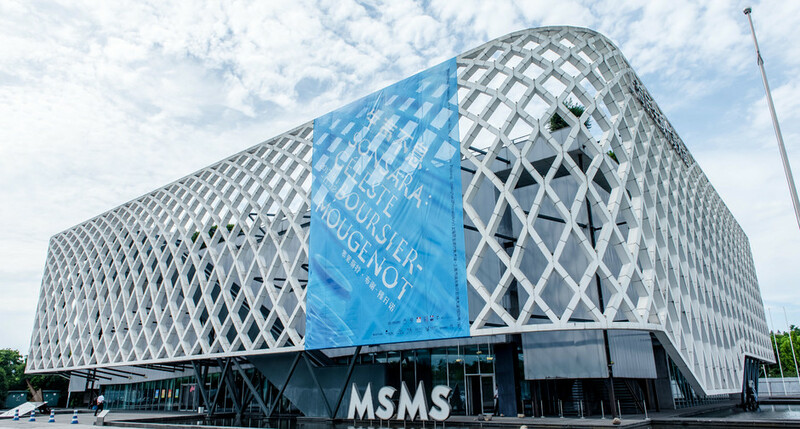 The original facade of the French Pavilion is clad in a new ultra high performance fiber concrete web, which not only fortifies the building but also shields it from sunlight thus bringing energy efficiency to the design. The pool which surrounds the pavilion makes the museum look like a white floating palace surrounded by gardens and greenery. 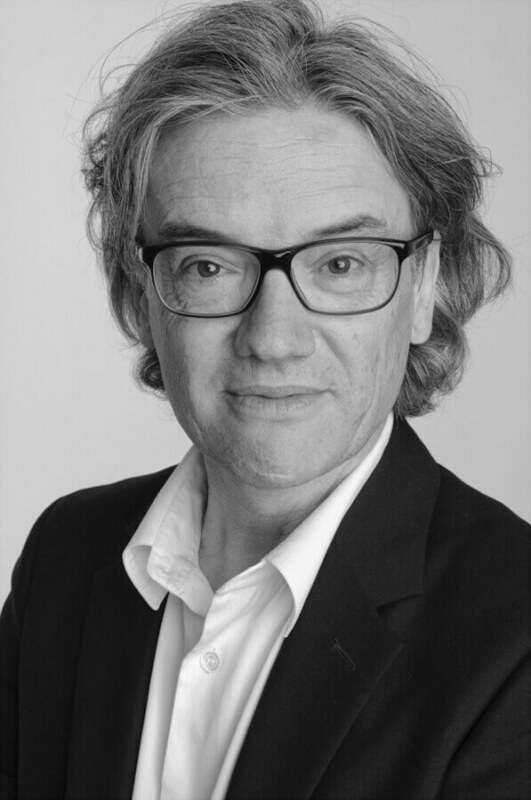 Jacques Ferrier's design is characterized by simple and elegant style similar to building blocks, which privileges the optimization of space. In the French Pavilion we do not only see the continuation of the mesh element, but also his adherence to environmental principles, the melding of science, cutting edge culture and nature. The fluid and airy nature of the architecture reflects the architect's peaceful outlook on life. In August 2013, construction began with Zhu Pei who ensured the preservation of the outside appearance of the French Pavilion, the unique features of the structure and the ramp. The architect optimized the space for the central functions of the museum which occur during the day and night, to bring out the elements of openness and multi-functionality. The reconstruction of the museum incorporates a 600sqm atrium which reaches a height of 12.5m and integrates a mechanical device to control the rooftop adjustable blinds. 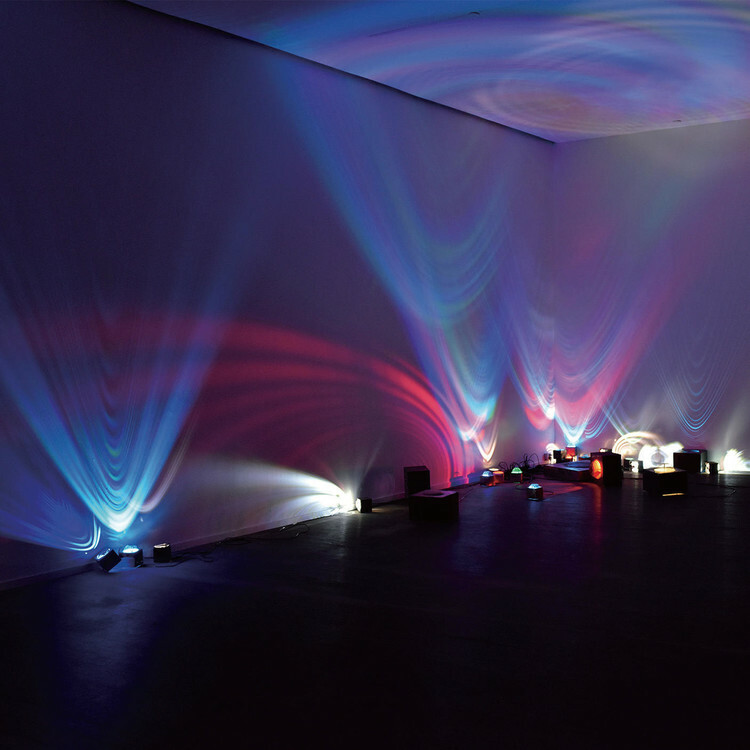 In keeping with industry standards, the museum features a permanent exhibition hall with climate-control equipment designed to exhibit world-class artworks. Meanwhile, the space on the ground plaza, office space, rooftop garden, café, gift shop and fine dining restaurant allow for indoor and outdoor cultural activities of various kinds and scales.